I missed this one last June. report on a new Pterodaustro egg, concentrating on the eggshell morphology and its chemistry while strangely ignoring the contents. Here’s an egg they identify by its proximity to a loose Pterodaustro skeletal element and the egg’s similarity to the earlier pterosaur egg (Chiappe et al. 2004), which includes a Pterodaustro embryo. And yet, there IS a nicely preserved embryo inside the 2014 egg! Here it is (Figs. 1, 2) traced using DGS and after reassembling the color graphic elements. Nearly every bone in the pterosaur is visible, down to the prepubes and wing tip unguals. The cranium, unfortunately, is below the two sets of free fingers, so it is difficult to restore without additional resolution (which I have requested). Figure 1. Egg image from Grellet-Tinner et al. 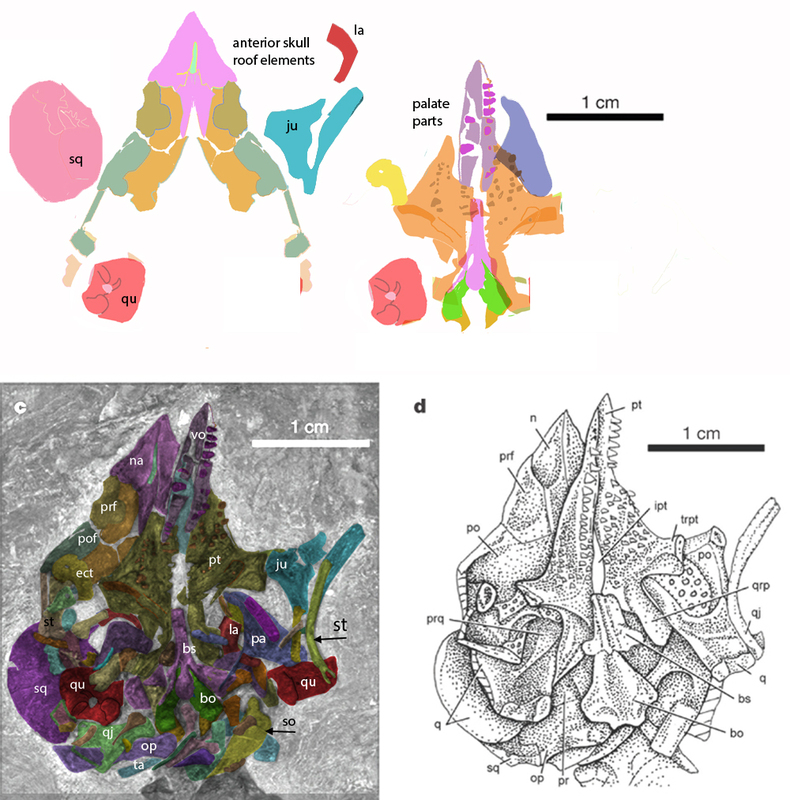 2014, DGS tracing of elements reveals a complete Pterodaustro embryo with a small cranium and long rostrum. Click to enlarge. Grellet-Tinner et al. identified this egg not by its contents but by its proximity to Pterodaustro skeletal element and its similarity to the 2004 egg, which includes an embryo. Earlier we looked at the first Pterodaustro embryo (Fig. 2) and discussed attempts by others at reconstructing the embryo without tracing the bones(!) here. Several years ago Laura Codorniu kindly sent me a high resolution image of the 2004 egg and embryo from which I produced that reconstruction. On agreement with her I have not published online that loaned egg image nor the tracing of it. (You might recall the 2004 egg was illustrated with a line drawing (Fig. 3), not a photo). Here (Fig.1) the egg photo is published (Grellet-Tinner et al. 2014. You’ll note the two reconstructions are essentially identical (Fig. 2) except for the slightly larger size of the 2014 specimen. Evidently it was in the egg a little longer and closer to hatching. Figure 2. Pterodaustro embryos compared. Note the 2014 (778) specimen is a little larger with more robust wing finger phalanges and a larger sternal complex. Click to enlarge. Let’s talk about the embryos first. The two Pterodaustro embryos (Fig. 2) are essentially identical, but the 2014 specimen is slightly larger with more robust and longer wing phalanges, a more robust proximal tail, more robust free fingers, and a larger sternal complex. These elements suggest it was getting ready to hatch and to fly shortly after hatching. Both embryos had the proportions of the adult Pterodaustro. That embryo data supports the hypothesis of isometry during ontogeny found in other pterosaurs, like Zhejiangopterus. The embryos had the basic proportions of the adult. 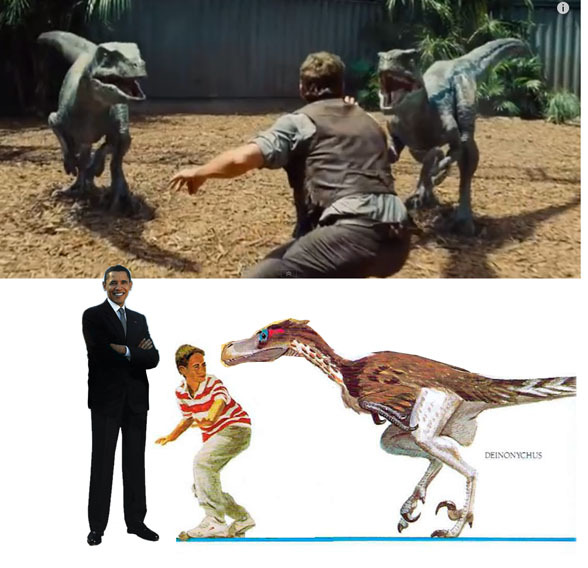 this hypothesis has been rejected by all other pterosaur experts that I am aware of, even in the face of incontrovertible evidence such as this. Bennett (1993-2007) is the traditional proponent of allometry (or great change) during ontogeny, having written several papers on it. There is no short rostrum in the two Pterodaustro embryos, much as some would like to imagine. Furthermore Phylogenetic analysis nests tiny pterosaurs as miniaturized taxa transitional between large taxa of one morphology and large taxa of another morphology. 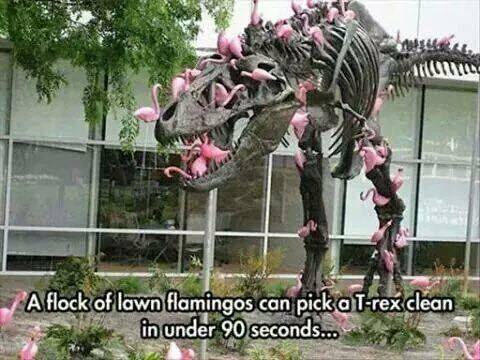 This happens often in the clade Reptilia and all of its subclades, like the origin of Dinosauria, Aves and Mammalia. It’s not a big deal. It’s common. Figure 3. 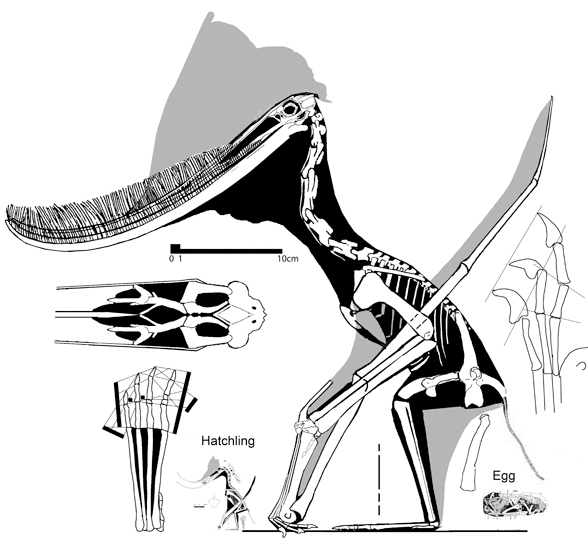 Pterodaustro adult to scale with the 2004 3mbryo and egg. Pterosaurs have very thin eggshells. The Asian eggs (Wang 2004, Ji et al. 2004, Lü et al. 2009) were considered ‘leathery.’ By contrast the South American Pterodaustro eggs have a calcium coating, but still extremely thin. Did that calcium coating maintain an elliptical shape? Apparentely so. That’s a great explanation for the differences seen in pterosaur eggs. an inverse correlation between eggshell thickness and length of uterine egg retention. So, with such thin eggshells, pterosaur females likely held their eggs in utero, as many lizards do, depositing them shortly before hatching. That hypothesis is also in direct contrast to that of most pterosaur workers (like Grellet-Tinner et al) who continue to consider pterosaurs archosaurs, but are stymied by the lack of a thick calcium carbonate eggshell, like those of birds and crocs. are important features of amniote eggs. They allow the exchange of gases and water between the developing embryo and the environment. Since pores are open to the atmosphere for gas exchange, they are visible on the eggshell surface sometimes without a microscope. However, distinct from archosaur eggshells, Pterodaustro eggshells have no pores, another clue that they were held in utero by their lizard-derived mothers. Unfortunately the G-T assumed that Pterodaustro was an archosaur. But that’s a mistake. Pterosaurs were lepidosaurs. And most, if not all of them retain the egg in utero longer than archosaurs do. Another outer layer on the pterosaur egg. 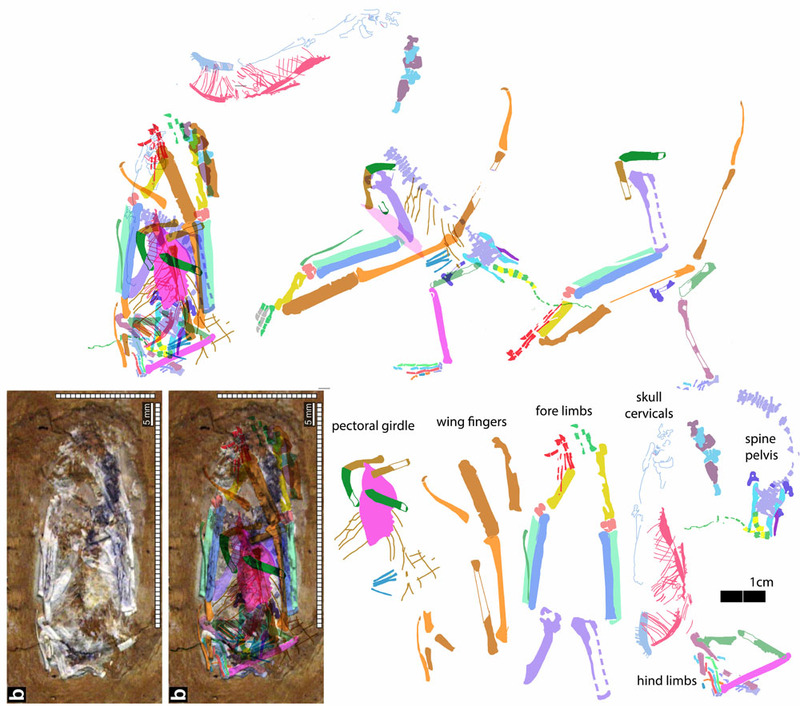 Since pterosaurs are not birds, this is a convergent appearance of the surface crystal layer. So at least some reptiles (pterosaurs) had this new layer. And yet some of the legs bones were broken and other bones displaced (Fig. 1). The tail extends beyond the shell boundaries. in that locality to find complete Pterodaustro specimens. Most are fragments and loose bones. I know of only one complete specimen. As in the Hamipterus find that includes a nesting colony disassociated bones and associated pterosaur eggs, the possibility must be considered that the eggs found had not been laid yet, but were inside the mother when she was killed, then as the carcass rotted, was transported and buried, the egg became disassociated with the mother and her disassociated bones. I’m no ob-gyn, but something tells me the pterosaur uterus likely also produced a mesohaline environment. Or the eggs could have been held in utero. See what happens when the first domino tells you ‘pterosaurs are archosaurs’? Darren Naish and other detractors are fond of saying that I see things with DGS that aren’t there. This Pterodaustro embryo is evidence to the contrary. All the bones looked like the other Pterodaustro embryo and both looked like those of the adult. Bonaparte J F 1970. Pterodaustro guinazui gen. et sp. nov. Pterosaurio de la Formacion Lagarcito, Provincia de San Luis, Argentina y su significado en la geologia regional (Pterodactylidae)”, Acta Geologica Lilloana, 10: 209-225.
is excited by the prospect of a new Jurassic Park 4/Jurassic World movie coming this summer, June 12. While most will be wowed by the special effects (yours truly among them), there will be a few who will roll their eyes so far back inside their skull that they will actually see their brain. Two issues to the forefront: size and feathers (Figs. 1-5). Figure 1. Click to enlarge. The Jurassic Park 4 giant sea monster (not sure if this is a pliosaur or a mosasaur) is feeding on a great white shark. Actual size comparisons below, from Giants and A Gallery of Dinosaurs by yours truly, 1986, 1989. Even the largest prehistoric sea monsters could not swallow an average great white shark whole. If the great white in JW is a typical 15 foot length, the skull of the monster is 2x or 30 feet in length. 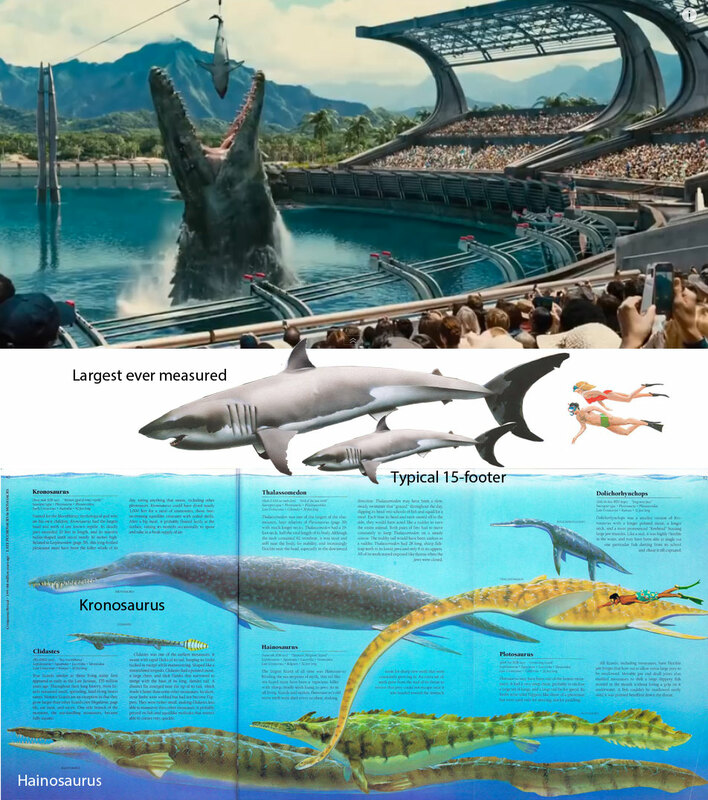 Based on the skull/neck ratio of the monster it appears to be a mosasaur possibly 250 feet long. And let’s face it, we go to the movies to be thrilled. We go to the library to learn something. Here (Fig. 1) The JW sea monster (pliosaur? or mosasaur?) is a wee bit too large for our great white shark former supervillain, now relegated to being a prehistoric dog biscuit or sardine. 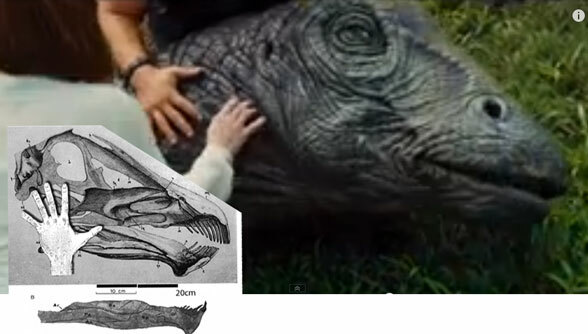 Based on the skull/neck ratio of the monster it appears to be a mosasaur possibly 250 feet long. Figure 2. Jurassic Park 4 giant Apatosaurus/Diplodocus-like sauropod. Inset, Diplodocus to scale. Sauropods (Fig. 2), the largest of all land animals, are made twice their original size in Jurassic World. Figure 3. 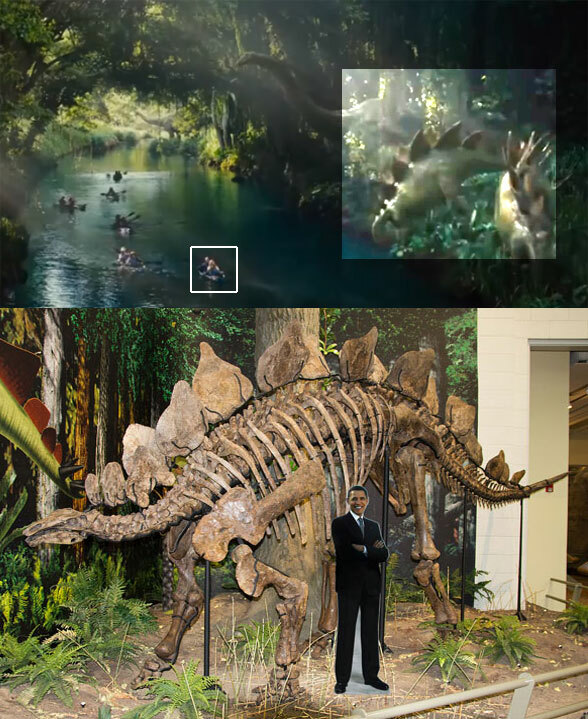 Jurrasic Park 4 giant Stegosaurus (above, highlighted by Photoshop) and to scale with President Obama (below). Jurassic World Stegosaurus (Fig. 3) might be on the large side as well. Figure 4. Here they got the scale right, but not the scales. Jurassic Park 4 scaly velociraptors (presumeably Deinonychus, above) and (below) feathered Deinonychyus from A Gallery of Dinosaurs by yours truly from 1989. That means JP4 is at least 24 years behind in its depiction because I saw feathered ‘raptors’ in various books a few years before that. Look, out of the sky! It’s a bird! It’s a plane! No its a flock of pterosaurs (Fig. 5). At first they seem like Dimorphodon. And hey, look! They have a narrow chord wing membrane attached to the front of the femur. But wait! The shadow is gigantic and has no tail. Then the lightweight pterosaur grabs a much more massive primate on holiday and without even an umphhh takes its prey aloft using its feet, like an eagle does with a salmon. Let me say that again, “with a salmon.” Then the metacarpals are revealed to be elongate. 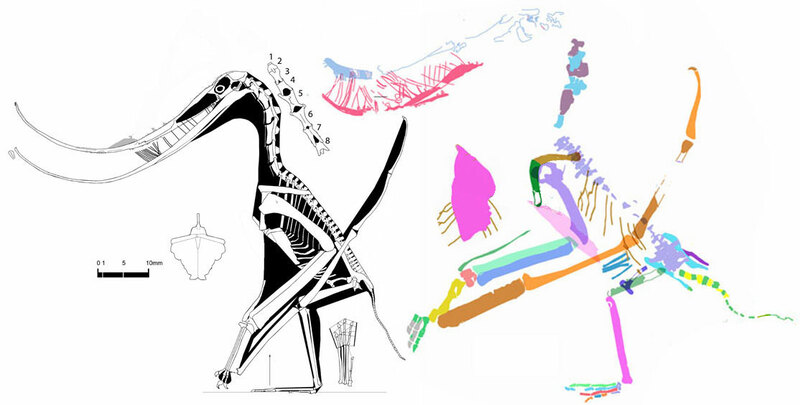 Perhaps not as exciting as all that, a few to scale images of pterosaurs are also shown below. Figure 5. Jurassic Park 4’s giant Dimorphodon(?) (probably weighing 36 lbs) picking up a tourist (probably weighing 120 pounds) in a tribute to Raquel Welch and Faye Wray who were taken aloft by Pteranodon. Below the rather feeble feet of several Pteranodon specimens, none of which had trenchant claws and mighty toe tendon anchors. These feet, some flat-footed others not, were made for walking. The foot of Dimorphodon with trenchant claws, but look how small it is to scale! Below that the even more feeble feet of the ornithocheirid Anhanguera. To read Giants and A Gallery of Dinosaurs free online, click here. Click here to see the Jurassic Park 4 trailer on YouTube. Click here to see the Jurassic Park 4 SuperBowl trailer on YouTube. See you at Jurassic World this summer! For your viewing pleasure. Not sure where this came from, but it should go viral. Figure 1. Varanosaurus, Ophiacodon, Cutleria and Ictidorhinus. These are taxa at the base of the Therapsida. Ophiacodon did not cross into the Therapsida, but developed a larger size with a primitive morphology. This new reconstruction of Ophiacodon is based on the Field Museum (Chicago) specimen. Click to enlarge. Earlier we talked about the role of Ophiacodon at the base of the Therapsida. Several years later that hypothesis is still in direct contrast to traditional thinking (Laurin and Reisz 1996 and other refs below) that holds sphenacodonts and Tetraceratops were basal to Therapsida. Figure 2. Closeup of figure 1 focusing on the smaller skulls at the base of the Therapsida. Click to enlarge. Conrad J and Sidor CA 2001. 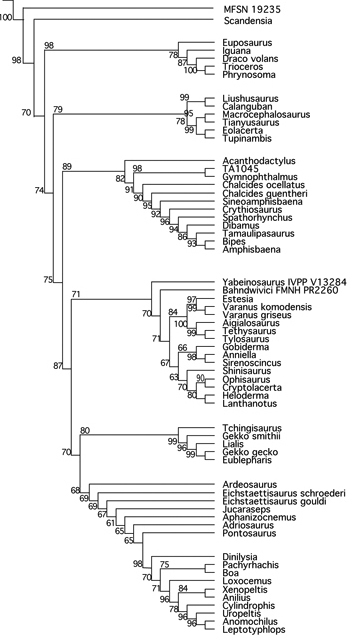 Re−evaluation of Tetraceratops insignis (Synapsida: Sphenacodontia). Journal of Vertebrate Paleontology 21: 42A. Matthew WD 1908. A four-horned pelycosaurian from the Permian of Texas.Bulletin of the American Museum of Natural History 24:183-185. Laurin M and Reisz RR. 1996. The osteology and relationships of Tetraceratops insignis, the oldest known therapsid. Journal of Vertebrate Paleontology 16:95-102. doi:10.1080/02724634.1996.10011287. Sidor CA and Hopson JA 1998. “Ghost lineages and “mammalness”: Assessing the temporal pattern of character acquisition in the Synapsida”. Paleobiology 24: 254–273. Updated February 17, 2015 with the addition of several more turtle taxa to figure 5. 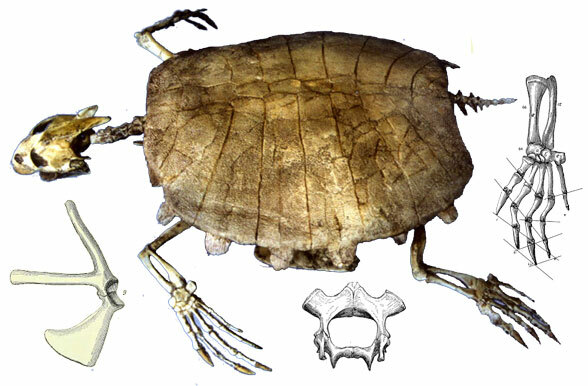 Earlier we looked at Odontochelys semitestacea, a primitive soft-shelled turtle with teeth (Li et al. 2008). The addition of the extant African soft-shelled turtle, Trionyx triunguis (Fig. 3) to the large reptile tree (Fig. 5), perhaps not surprisingly, nests it as a sister to Odontochelys and in doing so clarifies the reason why the carapace of Odontochelys consisted of neural plates only without osteoderms. By this evidence Odontochelys was a primitive soft–shelled turtle, AND, despite retaining teeth, was not THE basal turtle. Basal turtles must have radiated tens of millions of years earlier (see below). And all other turtle clades (like Elginia + Meiolania) independently and convergently lost their teeth. turtles diverged into various clades long before the Late Triassic appearances of Odontochelys (Fig. 2), Proganochelys and Proterochersis (Fig. 1), each of which already has a distinct morphology. Figure 1. Proganochelys and Proterochersis, two Traissic turtles already quite distinct from each other and from Odontochelys. Odontochelys may have retained teeth, but it was not a basal turtle. We can look back to Elginia in the Late Permian and perhaps Stephanospondylus of the Early Permian if we’re looking for clues to the origin of turtles with teeth. The latter was also basal to pareiasaurs like Anthodon and not far from Bolosaurus and Belebey. Figure 2. Odontochelys is a basal soft-shell turtle with teeth and anterior elbows and extremely pronated forelimbs. Trionyx (Fig. 3) is an extant soft-shelled turtle with congeneric relatives known back to the Cretaceous. Now soft-shelled turtles have a more ancient lineage. Figure 3 Trionyx, an African soft-shelled turtle with fossil relatives back to the Cretaceous nests with Odontochelys. With those long fingers, Trionyx was also not far from sea-faring turtles with flippers. Here the neural plates contact one another along their lengths, a more derived trait than seen in Odontochelys. sheds light on the posterior emargination of the skull to facilitate jaw muscles in extant turtles like Trionyx. This is what makes extant turtle skulls so odd. It looks as though Trionyx has a lateral temporal fenestra behind the jugal. Actually that’s the result of the large posterior embayment of the parietals, along with the decay of the quadratojugal and squamosal to vestiges, altogether enlarging the post temporal fenestrae now filled with large jaw muscles. Take away that complex of temporal traits, and the the two skulls of Odontochelys and Trionyx share a suite of traits. Figure 5. Turtle origin and early diversification with Odontochelys nesting as the sister to the soft-shelled turtle, Trionyx. More soft-shelled turtles will no doubt someday separate these two. Click to enlarge. This is a subset of the large reptile tree. Note Eunotosaurus is not close to turtles phylogenetically (contra Layson et al 2010), but developed similar ribs by convergence. Figure 4. Like Odontochelys, the African soft-shelled turtle Trionyx has a longer snout and a round flat shell not ornamented with dermal ossicles. Click to enlarge. Both turtles retain supratemporals, postparietals and tabulars, but these bones fuse to others in the extant Trionyx, leaving only faint margins and sutures. Note the reduction of the lacrimal in Trionyx, the envagination of the temporal region, the reduction of the squamosal and quadratojugal, the elongation of the supraoccipital and the reduction of the internal naris. A large pineal opening is a legacy trait from bolosaurids and Elginia. The addition of more taxa will no doubt fill these gaps. Note the very tiny premaxilla in both taxa. With its unusual temporal region, the skull of Trionyx is difficult to understand at first glance. So is the skull of Odontochelys, which has the additional disadvantage of being crushed. Soft-shelled turtle skulls reach the acme of oddness with Chitra indica (Fig. 8), the Indian narrow-headed soft-shell turtle, in which the eyeballs are placed on the skull where most tetrapods put their nostrils. 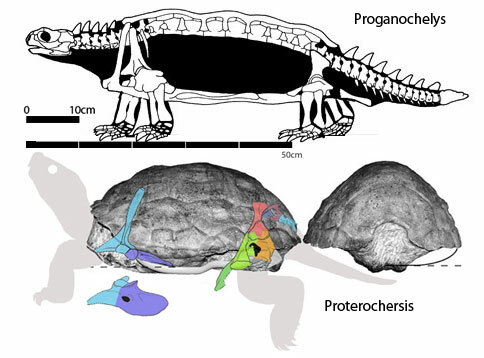 for high resolution images of the Odontochelys skull in order to prepare a more accurate reconstruction, but was told further preparation is underway. So, a new paper is no doubt forthcoming from them on this same difficult subject. The original reconstruction of the dorsal skull of Odontochelys (Fig. 7) makes it appear to be solid, like that of Proganochelys (Fig. 1). However, it is easy to see that there was a large pineal foramen there, the bones are not solid plates, and it is possible that temporal invagination had just begun. I’ll be eager to see what the authors come up with. What I present here must be considered as a preliminary attempt with vague data. We’ll compare notes later when their paper comes out. When it comes to the palate, many of my interpretations do not jive with the original observations (Fig. 6). Unfortunately I cannot see very many mirror-image left/right bones here, other than the obvious nasals, vomers and pterygoids. However, like building a model airplane from scattered parts, the present interpretations do produce a reconstruction in accord with Trionyx, a taxon which also nearly matches Odontochelys post-cranially. Figure 6. Reconstructing the palate of Odontochelys, part by part. Click to enlarge. Figure 7. Odontochelys skull material to scale. Click to enlarge. 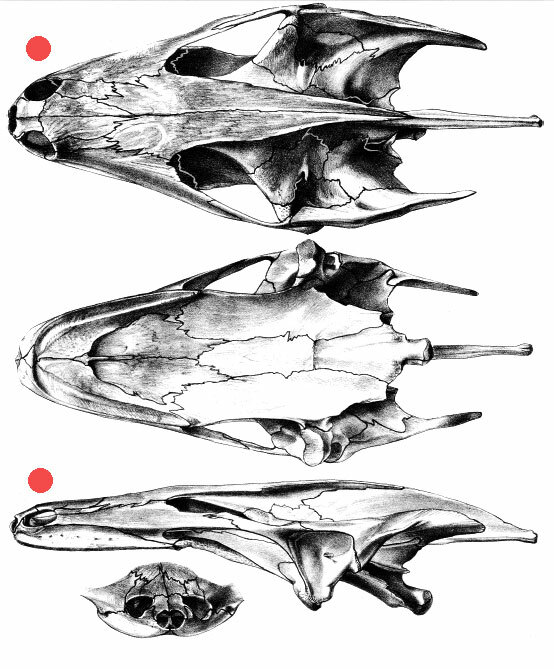 Note the skull reconstruction (top) is far more regular than the fossil from which the data was taken (second from top). The palate of the referred specimen is smaller than the palate of the holotype (bottom). Each provides several data points to help create the reconstruction. Without access to high resolution images I can take the reconstruction only so far. Here (Fig. 6) I’ve colorized and identified the crushed bones of the palate and skull roof in ventral view, then roughly reassembled them above. These elements were then used to create the present reconstruction (Fig. 2). Here (Fig. 7) are additional materials used to create the reconstruction of Odontochelys in figure 2. Note the dorsal skull fossil appears to be partly decayed and splintered making bone identification difficult. Luckily many of the skull bones were recovered in other views. So the dorsal skull only had to contribute relatively few. Note the parallel strips of bone at the posterior skull in dorsal view. I think this is an early appearance of the posteriorly projecting supraoccipital and thus an indicator of skull invagination, posterior embayment or both. We’ll see as better data comes in. Earlier, with fewer taxa in the large reptile tree, small blind burrowing snakes, like Uropeltis, nested with Heloderma and Lanthanotus, while more more terrestrial sighted snakes nested with gecko sisters, including Eichstaettisaurus, Adriosaurus and Dolichosaurus. Figure 1. A subset of the large reptile tree focusing on squamates. Note snake ancestors are still sisters to basal geckos. With the addition of several basal snakes (Fig. 1), like Xenopeltis and Loxocemus (which are found both above and below ground), the burrowing snakes join the terrestrial snakes in a single clade, still derived from gekko sisters like Tchingisaurus. I’m glad to see this happen. I’m always happy to make repairs when needed whether to my own work or elsewhere. Making repairs is always a good thing in Science. Adding taxa, which is what I continue to do with the large reptile tree (now 498 taxa), is often the key to understanding reptile relationships. I would have liked to have done this much sooner, but no one suggested adding more basal snake taxa to make this correction. There’s no time limit here, so corrections will be made as they arise. If you take all the burrowing snakes that used to nest with Lanthanotus and Heloderma, and force them back onto that node, the most parsimonious tree adds just 13 steps. The typical jump in steps between most adjoining sister taxa is 3 to 8. So 13 for an entire clade bump is not a big number. Convergence is rampant within the Reptilia, and quite rampant within the Squamata, a notoriously difficult clade to work with, as many have experienced, as shown here with several competing tree topologies by professional paleontologists over the past few decades. Figure 1 is the latest such entry, prone to modify as new data comes in. here and here we looked at what I thought was a novel nesting for terrestrial and aquatic (sighted) snakes with geckos (and blind snakes nest with Lanthanotus.) 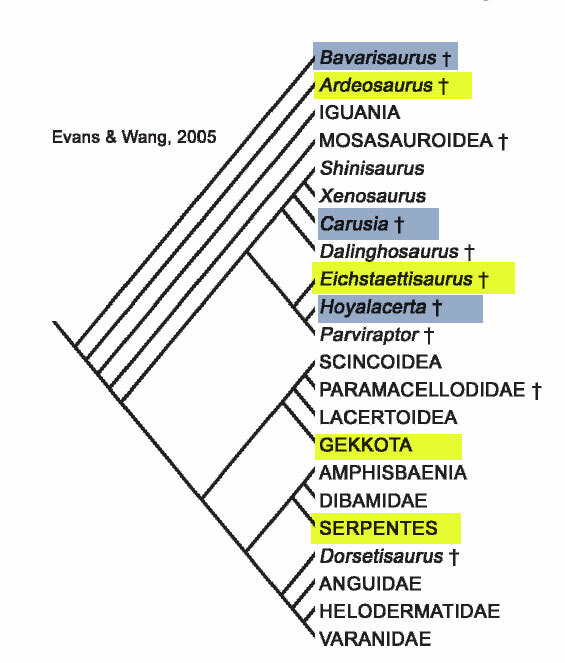 Then I ran across several previous cladograms that recovered the same or similar data with regard to snakes and geckos. Here they are (Figs. 1-4). 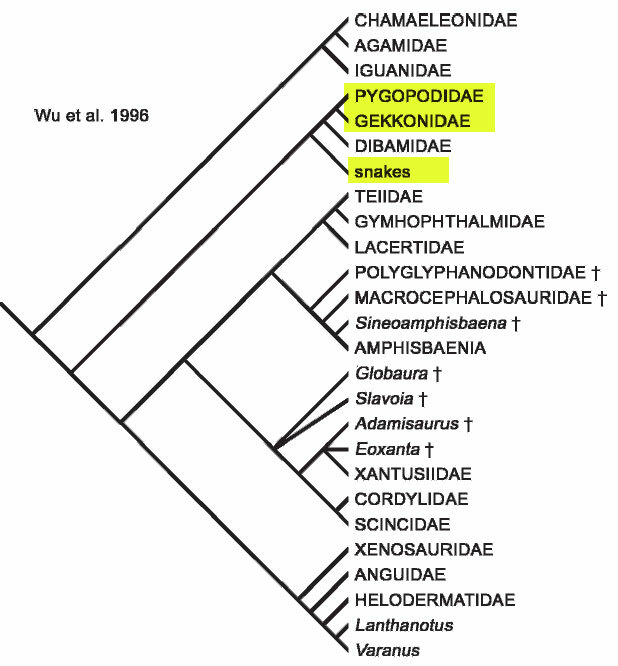 Seems as though geckos and snakes have been flirting with one another in several prior cladograms. 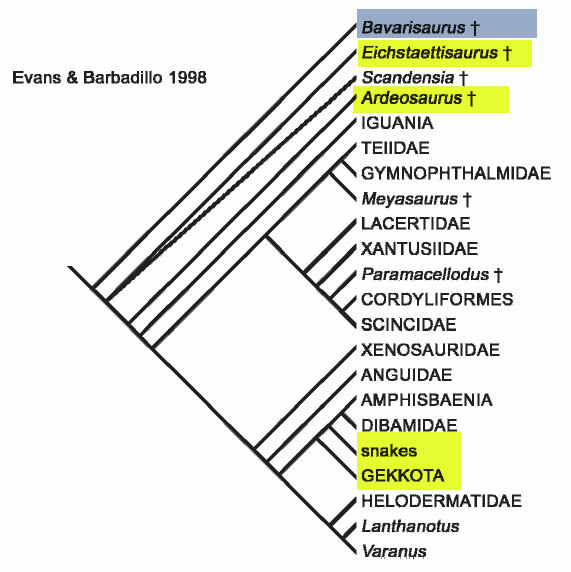 Evans and Barbadillo 1998 nested snakes with geckos, Dibamus and amphisbaenids, but apart from Ardeosaurus and Eichstaettisaurus, which the large reptile tree nested with basal snakes, like Adriosaurus and Pontosaurus. Note the nesting of suprageneric taxa, rather than generic taxa. Note to readers: Try to use species or specimens and let the clades form by themselves without presupposing even the most obvious suprageneric clades. Bavarisaurus, by the way, is not a squamate, but nests outside of the Squamata in the large reptile tree. 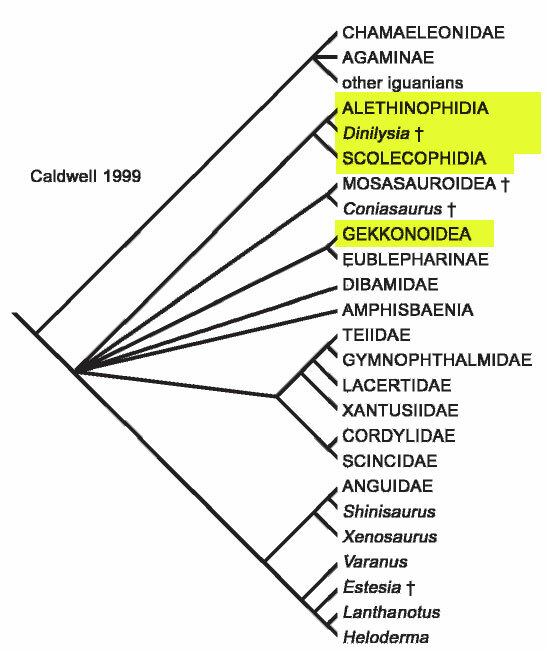 Caldwell 1999 sort of nested geckos with snakes, but only because that node was unresolved with regard to other clades too. Evans and Wang 2005 nested geckos + skinks with snakes + amphisbaenids. Here three taxa in blue boxes nest outside of the Squamata in the large reptile tree. Wu 1996 nested geckos with snakes. Wu et al. 1996 nested snakes with geckos and Dibamus. Caldwell 1999 connected snakes with mosasaurs and resurrected Pythonomorpha. Figure 5. Conrad 2008 nested snakes with amphisbaenids, which the large reptile tree nested with skinks. Conrad 2008 nested snakes with amphisbaenids. Figure 6. Gauthier et al 2012 also nested snakes with amphisbaenids. But note how close Adriosaurus and Pontosaurus (nesting with mosasaurs) are to geckos! Click to enlarge. Gauthier et al. 2012 also nested both blind burrowing and sighted terrestrial/aquatic snakes with amphisbaenids. Here (Fig. 6) it is interesting to note how close Adriosaurus and Pontosaurus nest with Eichstaettisaurus and the geckos. Jucaraseps is a key taxon that has been largely overlooked. It has the first loose premaxilla in the lineage. Even so, the removal of about five taxa on both sides of Jucaraseps are needed in the large reptile tree to shift terrestrial snakes with blind snakes. Caldwell MW 1999. 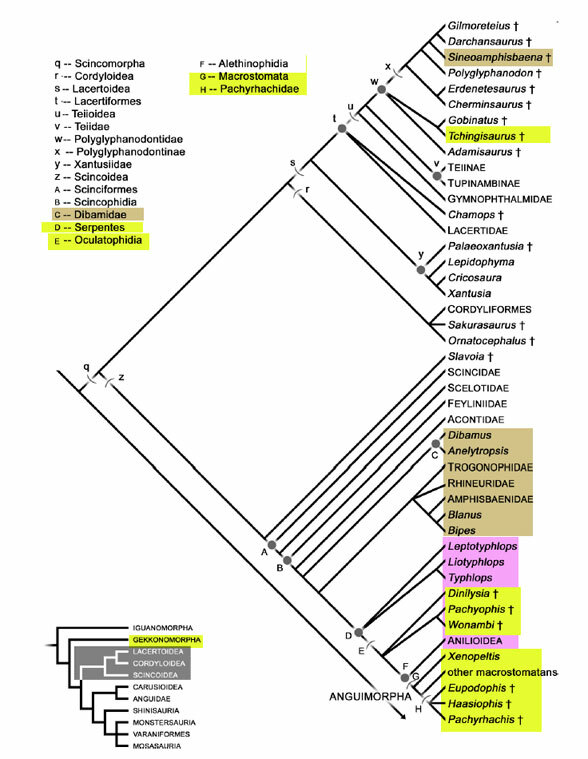 Squamate phylogeny and the relationships of snakes and mosasauroids. Zoological Journal of the Linnean Society 125:115–147. Caldwell MW 2006. A new species of Pontosaurus (Squamata, Pythonomorpha) from the Upper Cretaceous of Lebanon and a phylogenetic analysis of Pythonomorpha. Memorie della Società Italiana di Scienze Naturali e del Museo Civico di Storia Naturale di Milano 34:1–42. Conrad JL 2008. 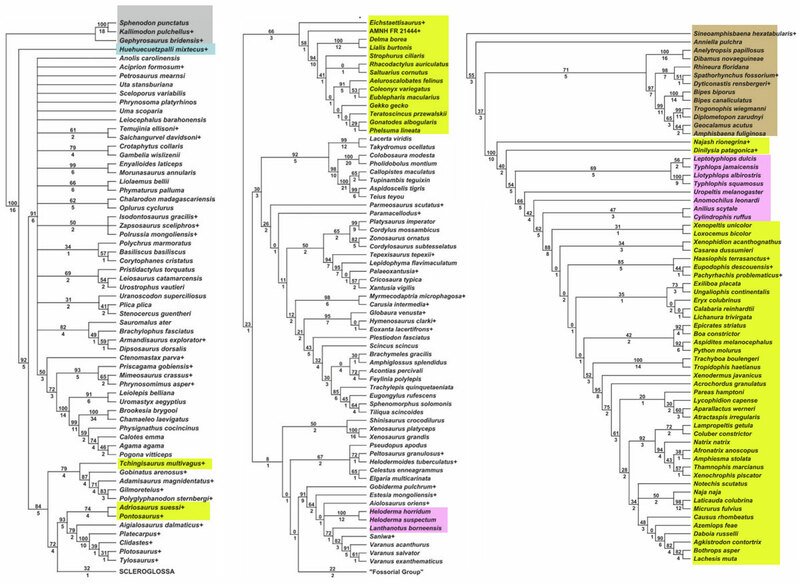 Phylogeny and systematics of Squamata (Reptilia) based on morphology. Bulletin of the American Museum of Natural History 310:1–182. Caldwell MW and Palci A 2010. A new species of marine ophidiomorph lizard, Adriosaurus skrbinensis, from the Upper Cretaceous of Slovenia. Journal of Vertebrate Paleontology 30:747-755. doi:10.1080/02724631003762963. Dal Sasso C and Pinna G 1997. Aphanizocnemus libanensis n. gen. n. sp., a new dolichosaur (Reptilia, Varanoidea) from the Upper Cretaceous of Lebanon. Paleontologia Lombarda 7:1–31. Evans SE and Barbadillo LJ 1998. An unusual lizard (Reptilia: Squamata) from the Early Cretaceous of Las Hoyas, Spain. Zoological Journal of the Linnean Society 124: 235–265. Evans SE and Wang Y 2005. Early Cretaceous lizard Dalinghosaurus from China. Acta Palaeontologica Polonica 50: 725–742. Gauthier JA 2012. Assembling the squamate tree of life: Perspectives form the phenotype and the fossil record. Bulletin of the Peabody Museum of Natural History 53(1):3-308. Haas G 1979. On a new snakelike reptile from the Lower Cenomanian of Ein Jabrud, near Jerusalem. Bulletin du Muséum national d’Histoire Naturelle de Paris Ser. 4 (1):51-64. Kornhuber A 1901. Opetisaurus bucchichi, eine neue fossile Eidechse aus der unteren Kreide von Lesina in Dalmatien. Abhandlungen der geologischen Reichsanstalt Wien 17:1-24. Palci A and Caldwell MW 2007. Vestigial forelimbs and axial elongation in a 95 million-year-old non-snake squamate. Journal of Vertebrate Paleontology 27:1-7. doi:10.1671/0272-4634(2007)27[1:VFAAEI]2.0.CO;2. Pierce SE and Caldwell MW 2004. Redescription and phylogenetic position of the Adriatic (Upper Cretaceous; Cenomanian) dolichosaur Pontosaurus lesinensis (Kornhuber, 1873). Journal of Vertebrate Paleontology 2:373-386. Seeley HG 1881. On remains of a small lizard from Neocomian rocks of Comen, near Trieste, preserved in the Geological Museum of the University of Vienna. Quarterly Journal of the Geological Society of London 37:52-56. Wu, X.-C., D.B. Brinkman DB and Russell AP 1996.Sineoamphisbaena hexatabularis hexatabularis:an amphisbaenian (Diapsida: Squamata) fromthe Upper Cretaceous redbeds at Bayan Mandahu(Inner Mongolia, People’s Republic of China), and comments on the phylogenetic relationships of the Amphisbaenia. Canadian Journal of Earth Sciences 33: 541–577.